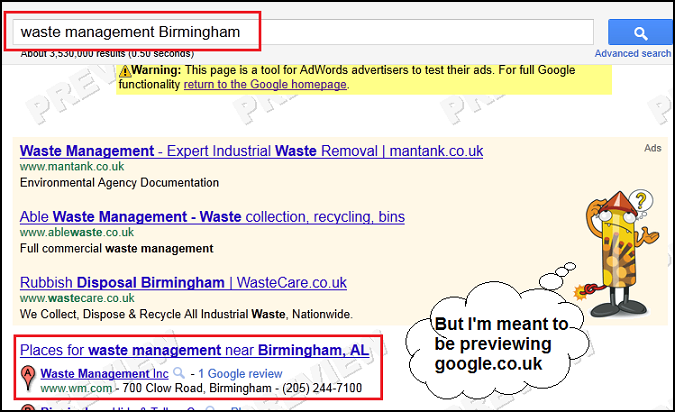 Boom / PPC / Google Ad Preview: Where Am I? Google Ad Preview: Where Am I? The Google Ad Preview Tool is an essential bit of kit that shows advertisers how their ads appear in Google search, both at home and abroad – vital for international accounts. It also allows advertisers and pay per click agencies to keep track of their performance in the search results without artificially inflating their ad impressions. Raising impressions without raising clicks leads to low Click Through Rates (CTR) that can lead to higher advertising costs. Not good. Simply put, this tool should be a god send – but is it? Not so long ago Google.co.uk was but a shadow of its American big brother, Google.com with US listings appearing in local search results. Fast forward to 2011 and Google have sharpened up local search in the UK, to the relief of all. So, I was a bit surprised to see a blast from search past in the Ad Preview Tool. Doesn’t the nostaligia for the bad old days of UK search yore just give you a warm and fuzzy feeling inside? That’s right, Google Ad Preview says Alabama is now in the UK. Either that or something has gone very, very wrong. Considering the leaps and bounds that have been made in improving local search in the UK, it seemed unlikely that this was a blip in the Search Engine Results Pages (SERPs), but I did run a search, just to be sure. As expected, Birmingham, West Midlands showed up in the real search results. So, what is the fuss about? If advertisers are being shown inaccurate organic search results, how can they trust the paid search results in Google Ad Previews to be accurate? What’s to stop them reverting back to the old “search Google for my ads” tactic and potentially wasting their budget? Come on Google, this should be a great tool, sort it out already!